Today a little ghost story told to me yesterday by a visitor from Tok. Many years ago, this woman, we will call her Mary, inherited a beautiful carved mahogany bed from her family in Pennsylvania. After moving it into her house she started sleeping on it and for a month every night she would have the same nightmare of a woman coming to her and trying to wake her up to go hide, because “he” was coming. After she had hidden she would see the man’s khaki pants and workboots, but never his face. Mary would wake up each night with the same dream. She finally went to her aunt and told her what was happening. The aunt sighed and said, “I was afraid of that”. The aunt pulled out a big family album and asked Mary to point out the woman if she could. Mary found the woman who had a distinctive “horse-face” and pointed her out. 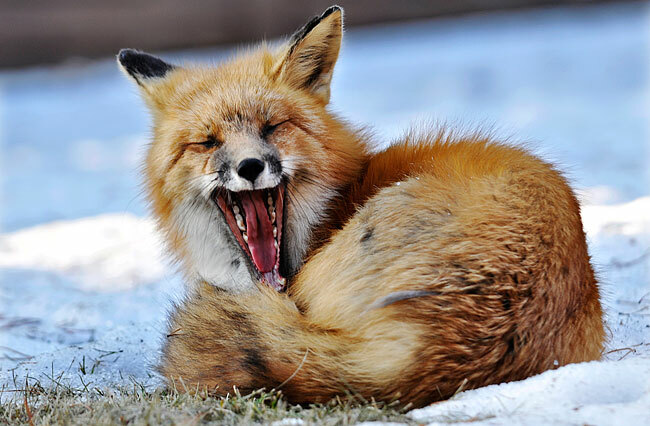 The aunt nodded and said, “Yes, that’s the woman who also would bother other relatives who had slept in the bed”. Apparently, many years ago, there was a man who lived in the house and would come to molest the girl who slept in the bed and the woman would come and try to hide the girl. 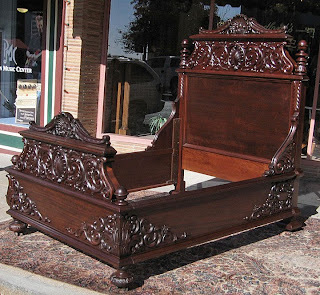 After hearing this story, Mary took the bed to the dump and saw it burned because she did not want anyone else to experience this phenomena. Although we know very little about Francis Mims, we do know that he was probably born in Oregon about 1893 and definitely died in Skagway on this day, April 29, 1898 at the age of 5 from meningitis. Francis’ remains were shipped home to Oregon. The Mims family did not stay until the 1900 census in Skagway. There are family records online that point to the Matlock family in Pendleton where Nellie Mims was living with her father and her kids: Hazel born 1896 in Oregon, Lulu born 1899 in Alaska, Pauline born 1894 in Oregon and Wesley born 1897 in Oregon. Oregon records show that Nellie divorced her husband Edwin in 1901. If that entire family came to Skagway in 1898, they were lucky to have only lost one child. The photo above is of Pendleton Oregon in 1905. Edwin was convicted on November 4, 1899 of manslaughter and was sentenced to 5 years in prison and $1000 fine. He had been involved in a barfight with a bouncer when Mims pulled out a gun and shot J. Henry Miller. On April 10, 1901 Governor T.T. Geer of Oregon granted him a full pardon. Presumably that is why Nellie divorced him. Edwin died in 1925 in Tonopah, Nevada. 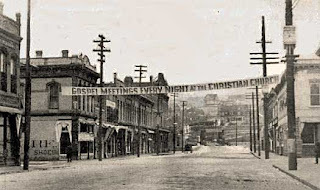 Citizen Call of Phillipsburg Montana of April 10, 1901 – online. James Whitson was born in 1849 in Haddington, Scotland. He had wandering spirit. As a young man, Whitson ran away to sea and served before the mast around the world. He met Marion Horlock Smith in Auckland New Zealand and fell in love with her. He settled in New Zealand and took over as manager of the Albert/Whitson Brewery in Elliot St, Auckland in 1883, living at the Auckland Club until he and Marion were married in 1884. In 1889 they moved to Melbourne, where James was promised a job with the Carlton Brewery, which ended him up in Hay, N.S.W. in 1890. His daughter Agnes was born there. He then returned to Auckland and because of his principles decided to find a new occupation. In 1895 went to Victoria, B.C. In 1896 he was an Accountant with British Columbia Cannery at Deas Island, Murray River, north of Vancouver. Whitson’s final job was a “Customs Broker” at Log Cabin. He was actually a book-keeper in partnership with Messrs J.T. 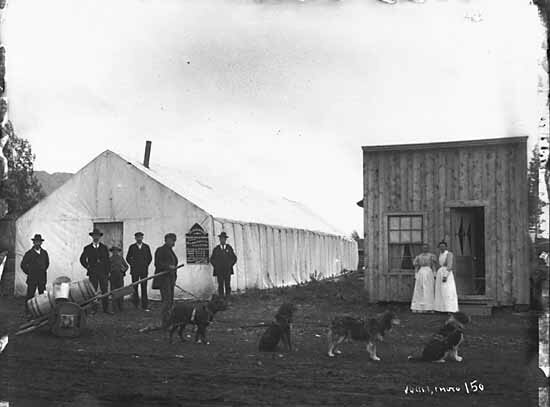 Bethune and Baker, a mineral exploration company in the Klondike. Soon after arriving in the North, he unfortunately fell ill with pneumonia and died on this day, April 28, 1899. He was 50 years old. After he died at Log Cabin, his body was shipped to Victoria and buried in Ross Bay Cemetery, Victoria (where Capt. Moore and his wife, and Nellie Cashman are also buried). Mr. Curtain worked for Michael Heney on the Railroad. According to the Skagway Death Record he was born and died on this day April 27. He died at Lake Bennett at 8:30 in the morning in 1900 from pneumonia. He was a member of the Woodmen of the World and so, he was embalmed and probably sent home, perhaps to Olympia which was his home of record. 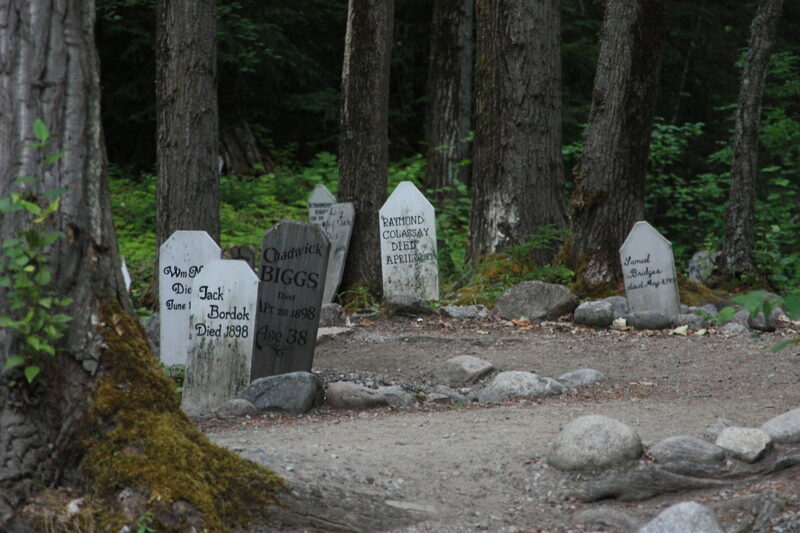 Some of the Skagway Death Records show the same date of birth and death, I was told by someone who worked there years ago, that the birth dates were sometimes put in as the same day as the death date because they did not have a birthday. They knew that the age at death was, in this case, 33, and so put the birth day as the same. (Eyes rolling at this point). In any event we know he died exactly 110 years ago at this hour and day! Captain George was known as the “father of Alaska pilots”. He was born on this day, April 23, 1834 in London England. Capt W.E. 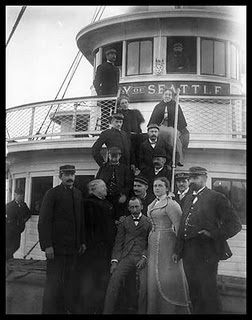 George sold the ship Alpha and was employed by the Pacific Coast Steamship Company, of San Francisco, operating the State of California, the Ancon, the Idaho and other famous vessels of the early steam-boating days, north from Portland, Oregon. In 1897 he joined the steamer City of Seattle at the time of the Klondike rush, operating on the Skagway run for Dodwell & Company. Captain W.E.George, skipper of the excursion steamer Idaho, one night in 1883, made an error. Confidently, he sailed up a long, sheltered inlet that offered an attractive shortcut to Sitka, only to run aground in the shallows that blocked the head of the inlet. The inlet retains the name of Idaho, recalling for posterity the captain’s misfortune. His son, Frederick T. was a sailor on the Alki, when in 1902 fell off of the Moore’s Wharf and drowned. Frederick was only 27 and is buried in the Gold Rush Cemetery. 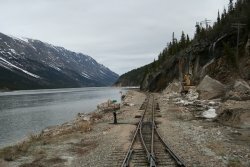 from the Skagway Death Records and a family rootsweb posting. Happy Earth Day. Keeping with tradition, nothing is planned for this day in Skagway. Mr. Hilbert was a German goldrusher who died on this day, April 21, 1899 on an island of Lake LeBarge of pneumonia, he was 40 years old. His body was sent to San Francisco for burial. 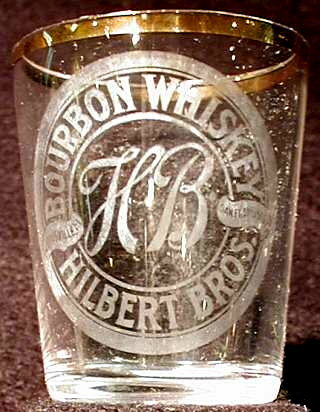 Hilbert Brothers produced whiskey in San Francisco from 1890-1902 when they became a mercantile company. See advertisement glass above. So, what was he doing on an island in Lake Lebarge anyway? The Yukon Archives does have an estate record for him which I have not yet viewed. The Reverend John Pringle was a Presbyterian minister who came to Skagway in 1898 and went on to build the first hospital, St. Andrews, in Atlin 1900. Pringle was born in 1852 but died on this day April 20, 1935 in British Columbia. 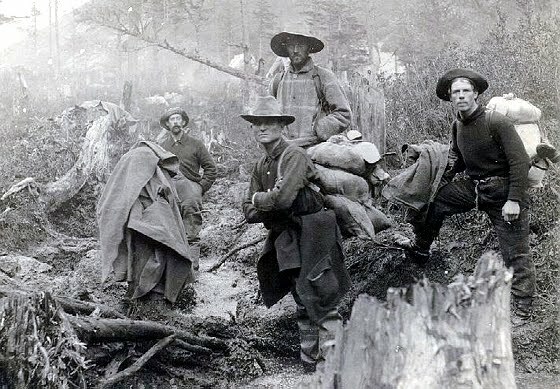 His brother George was also a Presbyterian Minister (who married Klondike Kate to her husband) and his brother James was a Sergeant with the NWMP who delivered mail from Dawson to Skagway. His sister Lucy worked as a nurse in the Atlin Hospital in 1922. The picture above taken by Anton Vogee in 1899 shows Pringle, perhaps his sister and the Presbyterian Church in Atlin. 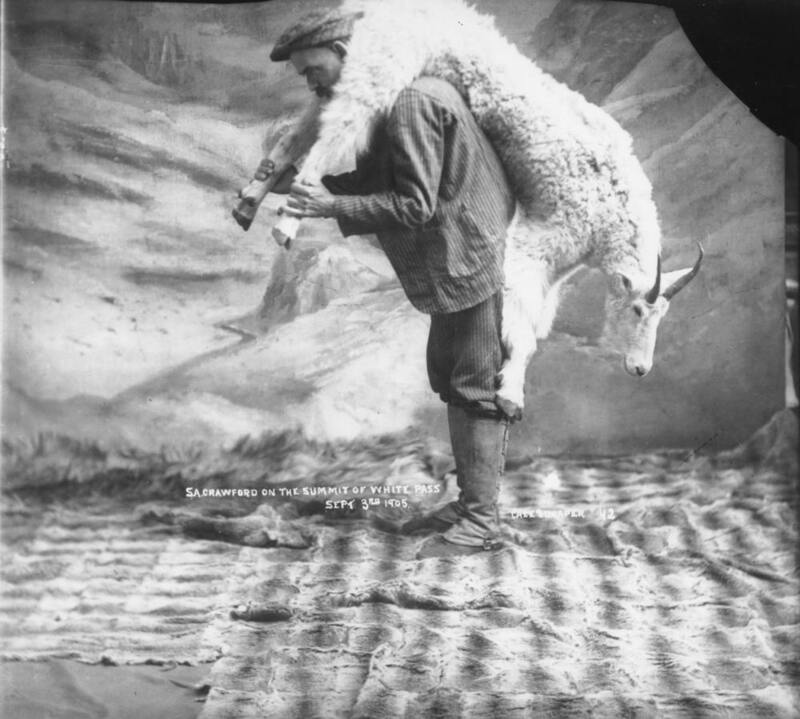 Famous for the photographs that he and his partner Draper took of the gold rush, Case was born on this day, April 19, 1868 in Marshalltown, Iowa. He came to Skagway in February 1898 and stayed until September 1907.Case and Draper photography studios opened in 1898, in a small tent in Skagway, Alaska. The partners later moved their business to a two-story building on Broadway near 4th Avenue, where they also sold curios, photographic supplies, Alaska Native handicrafts and game specimens. By 1907, the partnership between Case and Draper had been mutually dissolved; Draper kept the Skagway shop while Case opened a new store in Juneau. Case and Draper were best known for their portraits and photographs of the Tlingit Indians, early Skagway and the Gold Rush of 1898. Their views were reproduced in a variety of Alaskan books, including THE SOAPY SMITH TRAGEDY, and on postcards and White Pass & Yukon Railway souvenir playing cards. Case was a member of the Arctic Brotherhood, the Masons and later a Shriner. He married Alice J. Lindahl in 1898 in Skagway and had three children here. They all moved to Juneau in 1907 where Mr. Case passed away suddenly in 1920 at the age of 52. Seen above is a typical staged photo taken in the gallery.